The Wall Control Pegboard Standard Workbench Tool Storage Organizer Kit offers maximum tool board storage versatility and strength with over 10.5 square feet of pegboard storage space. Three 16in x 32in Gray powder-coated pegboard panels combine for a total tool storage area of 48in x 32in which will accommodate many pegboard hooks. The attractive Metal Pegboards are great for heavy duty tool board storage needs due to their 20 gauge steel construction that will not warp, fray, or crack and are over 10 times stronger than conventional pegboard creating an industrial grade tool storage solution that will last a lifetime. 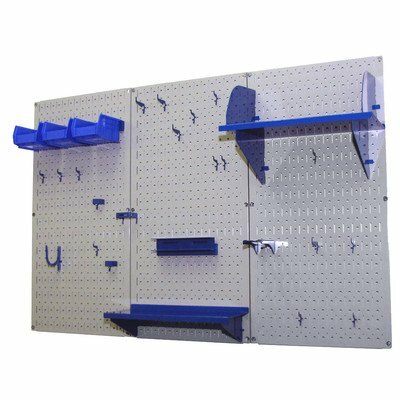 Wall Control metal pegboards offer both slots and holes to accept slotted tool board accessories as well as conventional 1/4in peg board hooks making this pegboard extremely versatile by giving the user multiple options with tool board accessory selection. The patented engagement of the slotted tool board hooks included improves hook security for more hassle free tool storage. These versatile, durable, and high strength metal pegboard panels are an easy-to-use tool storage solution for any garage, shop, or tool crib. The metal pegboard panels are easy to install into studs or flat surfaces with pre-drilled mounting holes on 16in centers. A built-in frame return flange provides ample hook clearance and full access to all holes without requiring additional framework or using up pegboard holes for mounting. Mounting hardware is also included. Wall Control Pegboard Products are Made in the USA. The Metal Pegboard Standard Workbench Organizer Kit Includes: (3) Gray Powder-Coated Metal Pegboard Panels 32 in. x 16 in. (Covers 48 in. x 32 in. when Installed), (1) 9 in. Shelf Assembly, (1) 6 in. Shelf Assembly, (3) Plastic Hanging Bins with Bin Hanger, (1) Screwdriver Holder, (1) Hammer Holder, Assortment of (20) Additional Hooks and Brackets. Mounting Hardware is Included. Gray Pegboards with Blue Tool board Accessories. Tools and Tool Sets Not Included.